Sea Hound Ahoy! 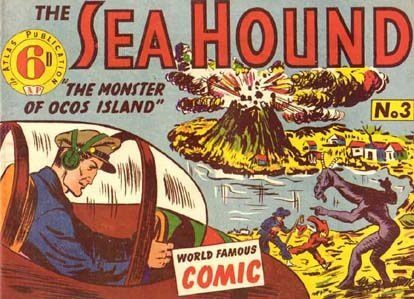 With Captain Silver and Jerry seahounding around, discovering spys and slicing up peg legs like they were sea cucumbers, this delightful adventure is sure to pound the sea hound in your heart. Barry Thompson and Ken Daigneau play Captain Silver. Bobby Hastings plays Jerry. Janice Gilbert as Carol Anderson, Alan Devitt as Kukai and Walter Vaughn as Tex. For years, children would slip on their hook hand, cover up one eye, grab the nearest parrot, and tune in each Monday night to this thrilling show! For more sea-faring fun, listen to Horatio Hornblower, Terry and the Pirates, Errol Flynn, and Dangerously Yours. I just wanted to let you know how impressed I am with your service. Orders are filled and shipped very quickly, so quickly that I am always amazed when they appear in my post office box. I also appreciate the wide range of titles in your Old Tim Radio catalog. There obviously are hundreds of MP3 discs available on every conceivable radio program topic in your inventory. Your price for all of these shows is extremely reasonable...and you still have lower prices when you place discs on sale. Thank you for quality items and very reasonable prices with excellent customer service.